A pocket-sized hand powered chainsaw. It´s tough, powerful and packable. It´s light weight and the handy case makes it easy to take along with you, making it a reliable companion for exciting outdoor activities. The saw provides smooth and effective cutting in both directions. The strong and durable nylon handles ensure a safe and comfortable grip. 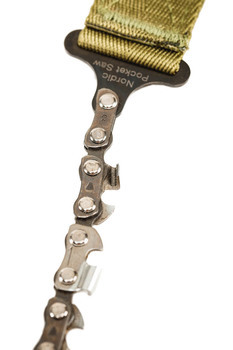 With the Nordic Pocket Saw you can easily cut hard-to-reach branches. 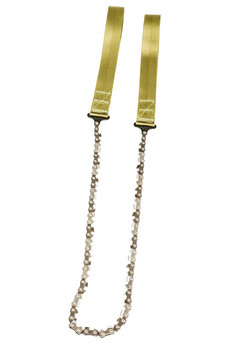 You can also use the Nordic Pocket Saw for dragging logs. Laboratory strength tests prove that the Nordic Pocket Saw cope with forces up to 5940 Newton or 20 times the power of normal use. 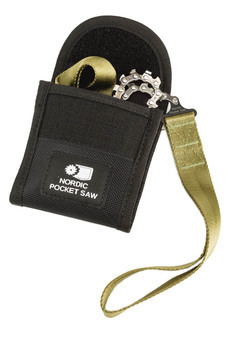 To summarize, Nordic Pocket Saw is practical, effective and durable. Eine Kettensäge mit handlichem Packmaß. Uns gefällt dieses sehr nützliche und leistungsstarke Werkzeug.